Just lay the new strut in the engine bay, with only the electrical harness connected. 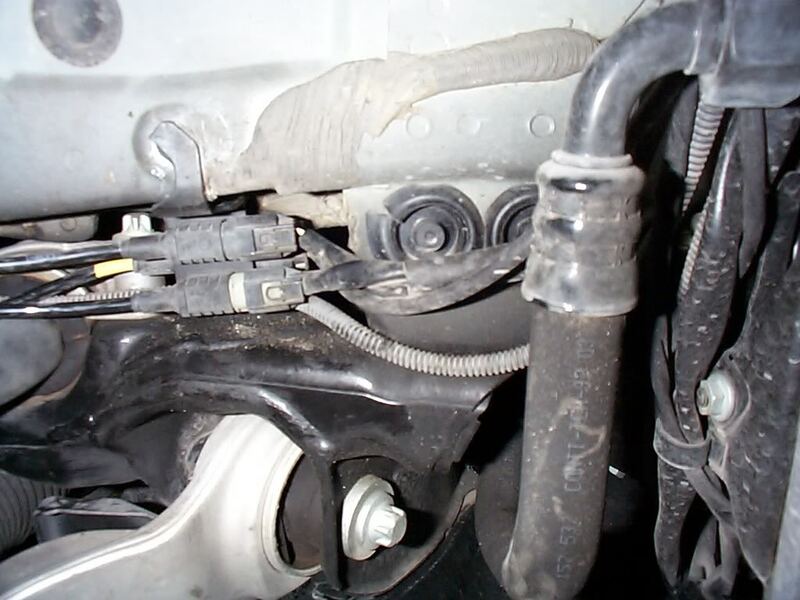 Connect the negative battery cable, you will hear relays clicking on and a quick hiss from the strut, no need to start the car. Disconnect/reconnect the negative cable many times and eventually it will drain enough air from the strut to collapse it by hand. I've just taken the strutt back out and laid across engine with electrical connection in and still no puff of air so not quite sure why other cars the same have been able to do and not mine at this point. Appreciate your help. If there is no puff now, I think you should be able to compress it by hand. It will try to expand back out slowly though. I got the strut loosely in at the top, then pushed up on it and compressed it enough to get it over that middle control arm. At last it's done, thankyou Mekantor for your help today and ofcourse Yachtmaster for the original procedure. I had actually given up on this because I had tried everything word for word in this thread and what worked for others just wasn't for me. I took the new strutt off and and just thought I'd see what would happen if I did the same procedure with the old strutt but when doing this I noticed one of the jacks had slipped a little and even though it was supported by another jack and axle stands I realigned the jack and wound the height up a little more. I plugged the old strutt in and lay on top of the engine and did the battery on and heard a loud jet of air that I had been trying for hours to get. I quickly swapped the plug over to the new strutt and the same happended. From then on it was easy. Disconnect/ reconnect battery until strutt would manually compress and in the space of 45 minutes the car was back in action again. The point to learn from my experience is that there simply must be a height sensor around the hub area and unless the car is well jacked up it doesn't register as being too high and let the air out of the strutt. Even before I adjusted the jack there was plenty of height to get the wheel off but clearly the jack needs to be higher and therefore the hub lower as this was totally and utterly the turning point from depression to a glass of wine! Hope this helps someone else who tries this job as once past this issue it really is quite an easy task and definitely not a MB only job. Good stuff, I was starting to scratch my head over this as it had worked so well when I carried out Yachtmasters DIY. thanks for the great write up yacht master and thanks for all the info from everyone else. my right front shock went out on my 03 e500 and i'm planning on using the info on this thread to replace it myself. before doing so, though, i wanted to ask you all if there are any other issues other than a blown airmatic shock/strut that would cause the same problem to make sure i rule them out before buying a new one. is there any way to verify that it is not a sensor, line, or valve problem? if it was a pump or valve issue would both front wheels be bottomed out? when i open the system "wakes" and i can hear the pump going but the front right doesn't go up. if the air shock bladder has a leak should i be noticing a hissing? should it continue to try to fill it up and leak out or will it stop? could it be a sensor or valve? and if so how would i check for that? The shock went out as I was driving across the George Washington bridge, of course. I could feel it pulling to the right and figured it was either a flat or a suspension/alignment problem, but it got worse and worse until the warning for car being too low came on. I pulled over when I could and got out of the car and made sure it wasn't hitting the fender when I turned the wheel... it wasn't so I used side streets to get home going slow with my hazards on. So it happened somewhat gradually while driving... I had already driven a couple miles before that. I pressed the button to raise up the ride height and all the other wheels went up except that right front one. Does all this info indicate anything to those of you with experience with airmatic systems? Is there anything I can do to test it to be sure? Are there other common culprits or does this sound like it's the air shock that is the problem? Just purchased used 2003 E500 with a slight pull to the right during test drive. Three days later front left air suspension failed - got same service light- Car too low. Three trips to two different repair shops (third a Mercedes Dealer) there is still a pull to the right. Three alignments performed. Oh -and a cracked windshield during the "test drive". Airbag had a slow leak - replaced also. Had the car for 4 days .. they have had it for 19. Do both sides of the Air suspension need to be replaced to fix the pull to the right? No. If the left is ok don't replace it. But you might want to consider a leak down test. I am sure MB has a method. Check ride height before anymore alignments. Perhaps the strut height isn't correct. 1) is there any sense in removing the control arm where it attaches to the subframe to avoid worrying about deflating the fully extended shock? 2) bilstein has a video for how to do it on an s-class ( http://info.bilsteinus.com/mercedes/# ) and in that video they disconnect the ride height sensor and measure ride height before tightening everything back up, is there any reason to do that? Is ride height something I should care about? or will the computer figure that out once the new one is installed? No and no. It's much easier to deflate the shock fully than removing the bolts attaching to chassis. You have to deflate it anyway so you may as well fully deflate. The ride height will be automatically set when all connected back up. It did take a very short ride for this to be done with mine though as the rear was very low from being jacked up at a slightly awkward angle but self corrected after a slow drive of about 50 yards down the road and has been fine ever since. Good luck. link didn't work is it correct? well, i installed the thing and it seems to be working, but i won't know for sure until i get to drive it a bit and let it sit overnight, i guess. i have to say, that was the easiest shock i've ever had to install, much easier than traditional coil spring setups or macphearson struts. i didn't have to remove a single control arm or ball joint (unheard of in my experience) or disconnect a thing other than the shock itself. the shock didn't deflate for me when i plugged it in as other people described, but i was able to install it while it was fully extended. i just used a big prybar (and i mean like 4ft long) against the subframe to lower the control arm as much as it would go and it was just enough to slip the shock over. i only had time for a very brief test drive, but everything seems to be in order. the only thing is it seems like the front right (where new strut is) is just a tad bit higher than the front left (roughly measured with my hand). is that something that should level out after driving? is it possible that the rebuilt airshock from arnott doesn't match the oem one on the other side perfectly? do i need to get it reprogrammed if it doesn't correct itself? regardless, i just wanted to post because i love these forums and appreciate the write ups others have done... and wanted to share the fact that i no longer despise the airmatic system because the fact that it was so easy to install mitigates the cost (and when cost-effective rebuilt ones are available i really can't complain). the video is a popup, so maybe pop up blocker is the issue? Anyone got a part number for the clip? Last edited by raleigh29; 08-01-2011 at 03:24 PM. I have done the rear's already and this doesn't look much more difficult that the rears. While the strut's harness was connected, and I had it laying under the hood, I would connect the bettery, hear a hiss, disconnect it, and then do it again many times. Eventually the strut had much less resistance to being compressed. Put it in and just attach the three nuts at the top so it can hang and move around, then you should be able to compress it enough to get it over the control arm. Hey Thanks mekantor really appreciate the quick response and it sure will make life easier. i am going to try it today and see how it goes i will post the results. Thanks once again. This is my first post to this site and I am very grateful for the pioneers who aren't afraid to try something new. My e500 Sport airmatic blew the front passenger shock. Having heard the rumors to how expensive those parts are, I was dreading a trip to the dealer. I had seen the re-manufactured air shocks before, but was completely resigned to the fact that it would be so hard to work on that I wouldn't be able to do anything. Absolutely wrong (by the way, I am a banker, not a wrench turner by trade). Last weekend when my car took a nose dive, I decided to take a chance on doing it myself. I bought the shock from Arnott Industries on eBay (free shipping through eBay). The shock shipped from FL last Monday 8/22 and arrived this morning in Utah (Monday 8/29) at 9:15. So 5 business days for delivery. I had removed the old shock according to the instructions I found on here so that when the new one arrived I could just bolt it on. At 9:15 the ups man arrived and I opened the box. The shock looks to be completely re-manufactured as it has new rubber with Arnotts logo on the part. I took the part to the car and the first thing I did was to jack that corner up a little more and lay the shock on the engine and hook up the 3pin connector and went to re attach the battery (as it had been disconnected during removal). I was a little worried how I would know that any air was being released, those fears were quickly removed as you could hear an fairly loud gush of air escape the shock, I was happy because I knew I was on the right track. I just kept touching the negative cable to the battery and removing it until I couldn't hear any more air rushing out of the shock (seems like it was about 15 times). I disconnected the shock from the connecter in the engine bay and reinstalled it as has been shown already in this thread and buttoned it up. Other than the shock being a bit stiff trying to get it up over the control arm, the install was very easy and straightforward. The hardest thing to do was to get the wheel well liner back in correctly, that sucker was stubborn. All in all the car was back on its feet and leveled off at 10am. Only 45 minutes from arrival. I took it for a quick spin and feels great. Hats off to Arnott for being in the market place, I hate spending retail for anything. I got 130,000 miles out of the original shock, I am not going to complain about having to replace parts. I knew what I was buying, I am just glad there other options than the dealer for quality parts. Well this is one club I was hoping I wouldn't join, but yesterday morning I drove my wife's '04 E500 to O'Riely's to pick up a new Aux. Battery and when I came out of the store with the new battery, I noticed the left front looked a little low. I sterted the car and it came up. After I got home the front left was looking low again. An hour or so latter the front left practically on the groung. I had to start the car to get the jack under the car. I lifted the car and noticed oil dripping out of the shock and a small mess on the driveway floor. I went on the Arnott web site and ordered a new one. Today I will take the old one out so the car will be ready for the new one. Thank you for this great write up! I do have one advantage that should make this very easy. When I put the V8 in my Crossfire I had to buy a SDS system. I did hook it up to the car yesterday and it is very easy to colapse the shock with a push of a button on my lap top. I removed the old strut today and did not use the SDS. I was very easy. I had to start the car to get the car high enough to get a jack under it. I removed the lower bolt and jacked the suspension up until it was fully compressed and then dorpped the jack and at the same time I pulled the bottom of the strut towards the rear of the car. the suspension dropped faster than the strut whiich made it very easy to get the bottom of the strut past the control arm. I then removed the top three nuts, airline and eletrical plug and removed the strut. I am hoping to have the Arnott strut by Wednesday. Last edited by LantanaML320; 09-11-2011 at 05:05 PM. Got the new Arnott strut in and car rides great, but is was a fiasco! I received a strut from Arnott and like other mentioned I released the air pressure. With the pressure released the bottom seal came apart. I called Arnott and they said DO NOT RELEASE AIR PRESSURE or you will risk the seal coming apart! They overnighted me another strut and I managed to get it in without releasing any pressure. removing the three top ball joint bolts allow the suspenson to drop a little more but it is still very difficult to get the strut over the lower A arm. I managed to push really hard on it while my son push the strut over the A arm. If this hadn't worked I was going to jack up the whole front end which will probably allow the suspension to drop further as the sway bar would be in a lower posisition which would allow more clearance to install the strut. the option would be to disconect the sway bar at the lower A arm. The Arnott is a great strut and was remanufactured differently than the original. Instead of the big metal sleve over a weak air bag, there is just a very beefy rubber air bag. My car has 30K miles on it and I am wonder how long until the others fail. Thanks for the pics on this DIY for front airmatic systems on the benz. I have a 2004 W211 (E500) and my left front failed. I had oil spots all over the side of the car and it was completely deflated so I felt it was a safe bet that it blew. I ordered the Arnott remanufactured airmatic shocks. I had them overnighted and in the next day. Took me about 1 hour per side. Was easy compared to replacing motor mounts. Anyway, very happy with the rebuilds from Arnott. They look like they are rebuilt with a heavier boot and will last longer. I think they have a lifetime warranty. The cost was $399 per side plus a $100 core charge that will be refunded when you send back your old shocks. Very cheap considering the cost from Mercedes. I can buy wholesale and could not come close to this price. Back on the road and happy. I had Mercedes replace the rear ones last year and bled for them at $3K. Again, thank you for the post. The only thing I would add is that I pulled the three 13mm bolts from the upper ball joint on each side to allow more room to get the old shock out and new shock in. Made it much easier. Sign me up to break the plastic clip today. This week my E500 was kneeling down on the left front. I put it in my shop followed instructions and ordered the Arnott strut. My only issue is getting the new one back in. Currently I plan to pop apart the top ball joint so not to have to deflate the arnott strut based on the last post about the seal comming apart. I found a tear in the bag and oil leaking out of the strut. NO.. for those thinking did I hit a pot hole. Normal interstate driving last week. Great fun. Todal cost about $5000 for suspension in 100,000 of driving.